Ready to embark up to 11 passengers and fitted out so that you can spend a few extra nights at sea, this new dayboat bordering on a sport cruiser allows a variety of exciting programmes. With greater thrills, technology and comfort, the Flyer 10 promises so much more than a standard dayboat. Never has the BENETEAU boatyard taken things so far and given so much consideration to an outboard powerboat. Powered by 2x350 HP engines, the Flyer 10 is equipped with Airstep® 2 technology and lifts off in just a few seconds to reach more than 40 knots. 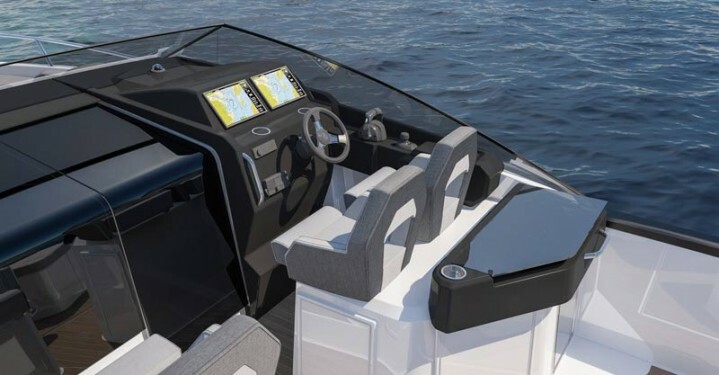 “To achieve this,” says Michaël Guinet in charge of outboard development at BENETEAU, “we have worked hard on the hull design and the navigation technology, to offer a driving experience that is both thrilling and perfectly safe.” As she is designed for trips with family or friends, leaving the driver all the fun and thrills was not an option. The Flyer 10 has a double seat to port side beside the console’s two bolster seats. So, four people can share the joy facing the sea underway, well protected behind the full-beam windshield with side panes. For a boat this size, the Flyer 10 is extremely comfortable both on and below deck. 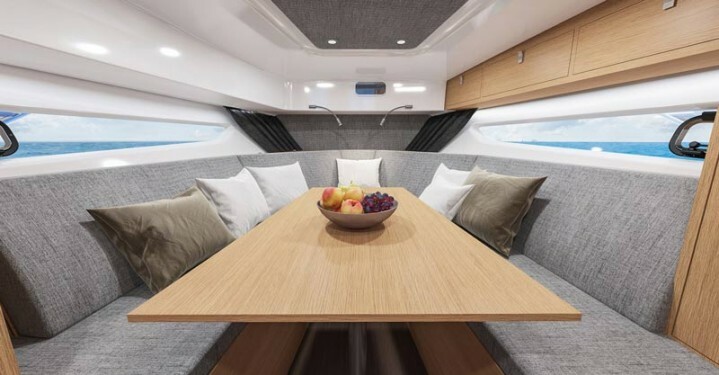 It is worth noting the foot rest seats in the cockpit, as well as an aft bench that folds back instantly to create a vast sunbathing area overlooking the swim platform. The galley on the starboard is fully equipped so that you can cook real meals while enjoying life aboard. There is a refrigerator, sink, twin burner, storage and even a small worktop. A rigid T-top or bimini can be fitted to protect this area. 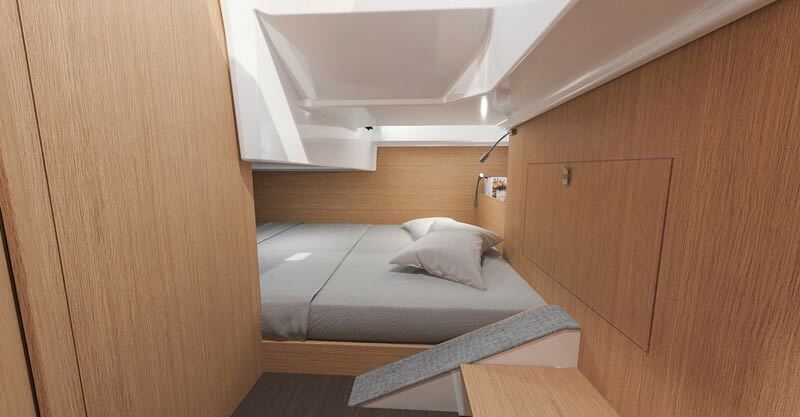 With two double berths and a real shower room, with the head separate from the shower, the Flyer 10 combines comfort with living space harmoniously. It is a joy to spend a few relaxing nights aboard. The central and mid-cabin are well lit by long hull windows. The big storage cabinet at the bottom of the stairway can be fitted out in a variety of ways. Living life in style on a day boat also requires intelligent flow of movement and on the Flyer 10 you can come and go as you like. A small gate opens onto the swim platform and offers safety underway. The swim platform is wide and deep, making it easy to move around on either side of the engines and even has room for a barbecue. A door is cleverly integrated into the windshield and opens onto the fore deck. Featuring the “smart walkaround” concept, the Flyer 10 marries easy movement on board with safety, and with an asymmetric single port walkway, she offers a bigger deck space, with a vast three people sunbathing area, and a unique amount of cabin space. 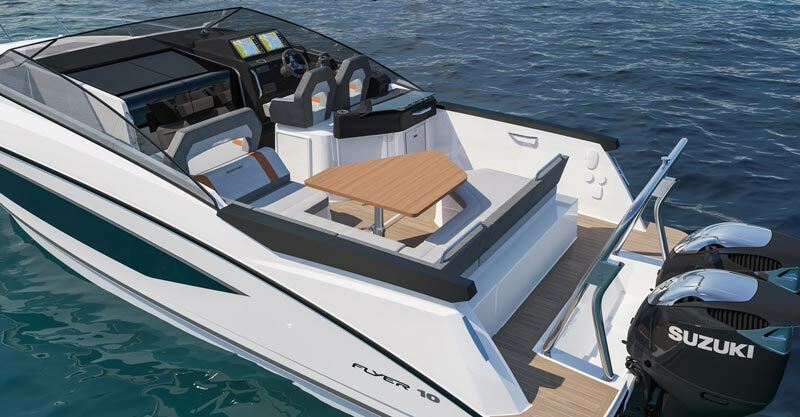 The new Flyer 10 is stylish, sporty and great fun, and her trim level is outstanding. Why not visit this beautiful outboard powerboat - a joy to behold and to live aboard - in Düsseldorf and at the other big shows in 2019?